This image of flowers visited by a bird is made of DNA, the molecule that provides the genetic instructions for making living organisms. It shows the latest capability of a technique called DNA origami to precisely twist and fold DNA into complex arrangements, which might find future use in biomedical applications. The basic idea of DNA origami is to take advantage of DNA’s fundamental properties—such as the precise pairing of its building blocks, the four DNA bases—to design structures that are much smaller than our tiniest cells. Until now, these nanostructures have resulted in a limited assortment of shapes. By improving the strategies for folding DNA, Hao Yan and Yan Liu , both at Arizona State University’s Biodesign Institute, created much more intricate and diverse designs based on computer drawings, including the one shown above. 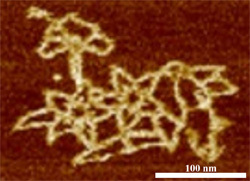 An electron microscopy image shows DNA folded into the intricate, computer-designed structure shown at the top. Credit: Hao Yan, Arizona State University. For more information on DNA origami research, see the Biodesign Institute at Arizona State University news release . To create their new shapes, the researchers first used a computer program to sketch out the overall silhouette of the DNA origami structure and to calculate the course the DNA molecule should follow. In small test tubes, they then mixed long DNA pieces with shorter ones that helped bend and stabilize the long pieces along the computer-generated path. 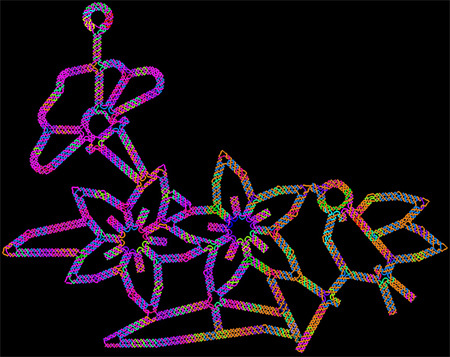 The end results, captured through a variety of imaging techniques, showed that the structures resembled the designed patterns. In an article describing their results and published in Nature Nanotechnology, the scientists say that this work demonstrates the feasibility of their DNA origami design strategy to create complex nanostructures that are difficult to achieve through other methods. They add that their method could enable new opportunities for engineering biomedical materials, such as molecular pouches to deliver drugs to where they are needed in the body. This work was funded in part by NIH under grant R01GM104960.